Professor Hausmann has responded again to my reply to his reply to my criticisms of his Project Syndicate post. It is a very gracious response. We are substantially in agreement on the three points that I raised in my previous post: the long-standing nature of Greece's fiscal fragility, the illusory GDP growth fuelled by the pre-crisis debt bubble that obscured the deterioration in Greece's financial position, and - above all - the long-term decline of Greece's competitiveness. And oddly enough, this means that we are also in agreement about the current situation in Greece, though we frame it differently. Professor Hausmann says that austerity is not the problem. I say that Greece's fiscal finances are not the problem. We are really saying the same thing. The real problem is competitiveness. Exactly why Greece's competitiveness has been so poor for so long is unclear. Tomas Hirst attempts to explain it in terms of oil shocks and politics, which I think is partly true. But I also think there are other factors at play, notably the ageing of Greece's population, the unusually high number of small and micro businesses in the Greek economy, and the influx of cheaper labour into Western markets after the fall of the Iron Curtain. I shall have a look at this in another post. However, there is a widespread perception that Greece's problems are primarily due to fiscal profligacy and excessive public sector debt. The story goes that out-of-control government spending caused the deficit and debt to rise to the point where markets refused to fund it any more, causing a "sudden stop". 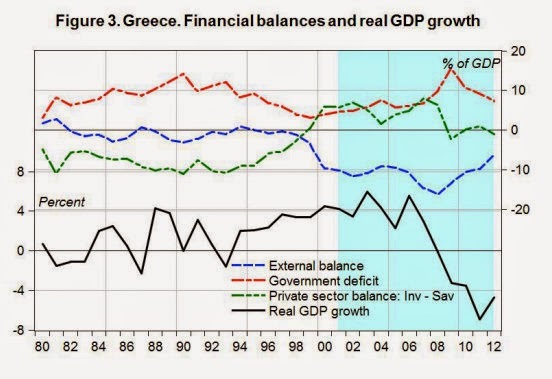 The primary focus of the EU & IMF adjustment programme so far has been on eliminating Greece's fiscal deficit and reducing debt/gdp in the hopes of preventing a further fiscal crisis: growth was supposed to return once confidence had been restored through successful fiscal adjustment. The fiscal deficit has indeed been more-or-less eliminated. But there is no sign either of improved confidence or much in the way of growth. And the aim of reducing debt/gdp has been thwarted by Greece's deep and persistent recession. Greece is therefore still under pressure to make further improvements to its fiscal finances. So is the Troika right to focus on restoring Greece's fiscal finances, including reducing debt? And is Syriza also right to focus on it, though from a different standpoint? But the truth is that the recession in Greece has little to do with an excessive debt burden. Until 2014, the country did not pay, in net terms, a single euro in interest: it borrowed enough from official sources at subsidized rates to pay 100% of its interest bill and then some. This situation supposedly changed a bit in 2014, the first year that the country made a small contribution to its interest bill, having run a primary surplus of barely 0.8% of GDP (or 0.5% of its debt of 170% of GDP). It is fair enough to point out that Greece was living well beyond its means until 2009, and that its productive structure needs upgrading. That inevitably implies a painful adjustment. But the pain has been unnecessarily great - a cumulative loss of more than 100% of GDP over the past five years - because Greece has laboured under unpayable debts, with most of the 'generous' EU loans used to pay private-sector creditors (notably, German and French banks) who should have taken a big hit in 2010. Had Greece's debts been restructured in 2010, austerity would have been less brutal, the private-sector recovery swifter and the slump less deep than they have been. Even now, Greece's massive debt overhang - and the uncertainty about Grexit and the chill to investment that this creates - is a huge obstacle to recovery 'whatever reforms' Greece does. How can we reconcile these two views? As can be seen from this chart, the private sector's debt-financed investment boom came to an abrupt end in 2008-9 when the capital inflows reversed. The external deficit reduced, the private sector deficit disappeared completely, the government deficit ballooned and real GDP fell off a cliff. So the story of the Greek crisis is not really one of fiscal profligacy resulting in a "sudden stop". It is one of PRIVATE sector profligacy fuelled by rising external debt, itself resulting from (or caused by) falling competitiveness. As happened to so many countries in 2008, the banking crisis forced private sector debts on to the public sector balance sheet. 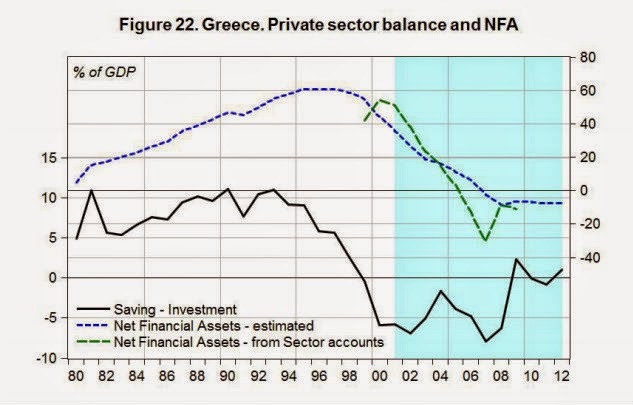 The difference between Greece and other Eurozone countries is that when it was forced to socialise private sector losses, it already had legacy debt of 100% of GDP. The fact that debt/GDP had been that high since 1993 was not the point. Seeing Greece's debt/gdp soaring, frightened by papers such as this from Reinhart & Rogoff suggesting that high debt/gdp was economically disastrous and angered by the disclosure that Greece's fiscal position was far worse than they had been led to believe, investors ran for the hills, causing Greece's borrowing costs to spike and creating a real risk of default. Their behaviour brought about the very situation that they feared. Clearly, there was substantial investment in fixed assets, which abruptly reversed in 2008. The spike just prior to 2004 is probably construction for the Athens Olympics. But what was the spike after that? The fact that the capital flows reversed so dramatically in 2008-9 suggests that this was generated by "hot money" looking for return without commitment. Similar spikes in other countries at the same time are associated with residential and commercial property booms. 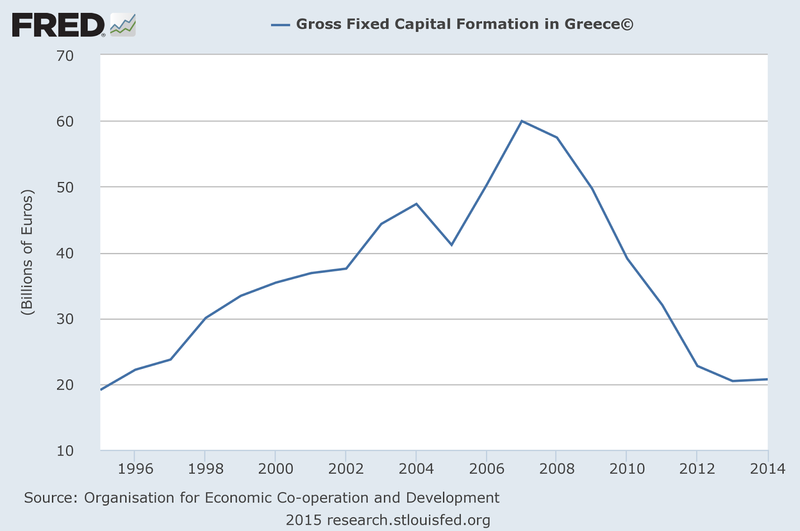 Did Greece have a property boom in the mid-2000s? Whatever it was, it wasn't long-term productive investment. The present position is that both the public and private sectors are significant net foreign debtors. Neither is in a position to lend, so the only source of funds is external. And since neither can pay back what it already owes, foreigners are understandably reluctant to lend more. Restoring fiscal finances without further falls in real GDP is therefore only possible if there is a large and sustained external surplus. Professor Hausmann is indeed correct about this. In the absence of international funding, Greece's only hope is to export its way to recovery. But this is where the competitiveness problem comes in. 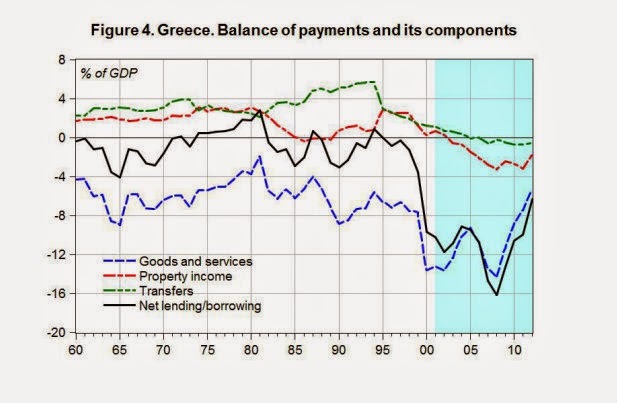 Greece has struggled to maintain its current account in balance, let alone surplus, for the last half-century. Even with the enormous falls in unit labour costs in recent years, it is hard to see that it would be able to maintain the substantial trade surplus that is needed to restore its economy. Professor Hausmann says that Greece's problem is that it doesn't make products that the world wants. But I don't buy this line of argument. Demand for Greek olive oil or feta cheese would be significantly higher if they were properly marketed and sensibly priced. No, the real problem is that businesses are far too short of capital investment and productivity is far too low. And Greece is also hampered by the abject failure of the EU to deal with the large and growing trade surpluses in certain core countries, and by general shortage of demand both within the Eurozone and globally. This is not a good time to be trying to generate an export-led recovery from an appallingly low base. And for that reason, I stand by my original argument. Greece's fiscal problems are not the "core" issue. Rather, they are symptomatic of a long-term private sector malaise. Furthermore, trying to restore Greece's public finances without addressing Greece's dismal business investment and the shortage of aggregate demand in the Eurozone as a whole is doomed to failure. The EU & IMF adjustment programme is fatally flawed, not because it is "unfocused" as Professor Hausmann suggests, but because it focuses on the wrong things. Greece needs debt write-down in both the public and private sectors, plus business and infrastructure investment. The core countries that are allowing their trade surpluses to grow well beyond agreed limits require EU adjustment programmes of their own. And measures are required to improve Eurozone aggregate demand: the ECB's QE programme may help, as may Juncker's investment scheme, but it is questionable whether these will be sufficient to offset what remains an unjustifiably tight fiscal stance across the entire bloc. Greece's post-war recovery was made possible by the Marshall Plan. Who now will provide a credible plan for its post-crisis recovery? I recommend reading the whole paper. All this debate about competitiveness is fine and dandy. But look, the real problem is that for people in the periphery of Europe finding capital to invest in industrial and high value added technology based businesses is very hard. Why? This is hard to explain but I base it on my own experience. I tried to build a technology based companya few years back. When the moment of truth of raising real capital came there simply were no investors willing to take the risk, neither in Spain nor out of Spain. Was it that they did not trust my project? Possibly, but they weren't trusting other entrepreneurs as well. There has been more than abundant capital for construction projects in the bubble years, but that was it. Industrial or technological projects were not getting enough access to capital. Because, who would risk €10 million in a risky project when you could make a safe bet in the construction industry? Or so they thought. The fact is that few entrepreneurs could attract enough capital to get beyon the start-up phase, most mid-sized firms stagnated and most mid-sized industrial companies could not face competition from Asia. You could argue that it was a problem with efficient assignment of resources from the not so efficient intermediaries of the financial industry but you cannot blame for not wanting to take unnecessary risks. When the real estate bubble was over the German banks just pulled their money out (with the invaluable assistance of the bail-out programs) and moved somewhere else. Investors who want to invest in technology driven companies go to Boston, San Diego or Silicon Valley because of the hub and cluster effects. Globalization has winners and losers. Being peripheral has a lot of implications; one of them is that you are probably going to be a loser. The pessimistic conclusion is: if you want to live in Greece set up a family hotel or restaurant (you will have to dodge your taxes to survive) and if you have ambition, emigrate to where the capital, talent and opportunities are clustering. It would appear that for most banks something close to 90% of their loan creation goes into real estate mortgages either commercial or housing. Given that tax authorities have developed expertise in assessing individuals for a tax take could their role not be expanded to undertaking assessment for that basic commodity a roof over people's heads and sovereign government's ability to create money debt and interest free used to provide low interest home mortgages covering costs and defaults. Since governments have responsibility to deal with tamping down abnormal inflation they would have little incentive to abandon sensible under-writing standards or even create fraudulent NINJA mortgages like the private bankers recently did prior to the GFC. Add to that the mistake of joining the Euro and you have the recipe for the loss of competitiveness of Portugal, Italy, Spain and Greece (all peripheral countries with a subordinate role in the new German Europe). In other words: it's the mezzogiornization" of all Southern Europe (including Southern France). The once heavily industrialized Catalonia has lost a lot of its industry. The heavily industrial Basque Country has managed to remain so thanks to very active industrial policies of the Basque Government who enjoy a fiscal priviledge. The North of Italy is also struggling. The situation of agriculture in Spain is not a pretty sight either with some excepctions in off-season production. I wish it were a problem of public opinion. If I have a job or a successful business I might be upset by the political situation or not but I might be reasonably content. If I am unemployed or I've had to close down my business I am likely to be bitter. Today there a lot of bitter people in Southern Europe and Northern European public opinion is being told various myths and phantasies aobut this. I am not optimistic. Short-term the conservative European press might think that they have arm-twisted Tsipras and Varoufakis and be happy about it. In the long-term if Syriza, who is pro-European, cannot show some success they will be replaced by something more radical and dangerous. I think as Stuart. Sure, There is a problem of competitivity level In Greece (And Spain), an structural one. Greece got a hugh devaluation since de sixties, in spite of what it never reach a definite external equilibrium. (See graphs in http://www.miguelnavascues.com/2015/03/no-todo-es-monetario-no-todo-son.html). In any case, I'm not confident that Syriza is the solution gir Greece, on the contrary, is very big problem. And Haussmann has a point; Greece has a long run fiscal problem. Nothing of that will be solved with monetary solution. Sure, I'm a "enragé" anti euro. IIRC one reason why Greece has run big budget deficits historically is that it has very high military spending for such a small country due to its rivalry with much larger Turkey. It's some years ago, but Migeru, myself and some others had a long discussion of this phenomenon on Eurotrib - mostly anchored around Spain. There's a crucial problem inside the EU, because with the ban on trade barriers and industrial policy, it's virtually impossible to grow an industrial base. As Stuart outlines, there are just too many factors pulling in the opposite direction. One might also invoke Ha-joon Chang's critique of Ricardo - static allocative efficiency locks countries into their existing industrial level. Frances, I notice your site places 2 LSOs on my hard drive whenever I turn up. Doesn't happen with other blogspot.co.uk sites I visit. "Local Storage Object" Frances. Web sites use them to store data for later use in your browser cache. However, I’m not seeing any listed for your site - perhaps a Google Ad that the OP had but we didn’t is to blame? I really have no idea and wouldn't know how to find out. All of your analysis is based on the assumption that Greece is a functioning state. Unfortunately, there is not one piece of legislation that supports long term planning and investment and second the state is in such an archaic state they don't even know for example if a person that gets a pension from one public pension fund is not getting a second one from another. In such circumstances when funds become available, like after the introduction of the euro, the public sector will invest or spend to buy votes and the private sector will speculate short term or build houses. You can never prosper like this. The real question is why the eu authorities did not see this before accepting countries like Greece in. I believe that they were rushed to complete the project to fast before real convergence occurred. My question to the author is can real convergence happen now and how? or are we doomed to see the end of the Euro? There's a non-economic argument that the populace of Greece are as corrupt as their government - that is no-one trusts anyone else, everyone expects to have to pay bribes, and the size of the black economy is perhaps double the size of other European states. This is not to say that the Greeks are 'bad people', only that distrust has built up over the years (centuries) until it is 'rational' to look after yourself first. Such a community will find it difficult to pull together to get out of a financial hole, or even appreciate the need to do so. The Euro business just papered over the cracks, for a while. Very interesting. But is better productivity in feta cheese and olive oil the answer, or even the cleanup of Greece's public sector? Could it be that Greece and other small peripheral economies are simply finding their natural worth in a global economy. More worryingly the same global forces seem to apply even to the major economies. The idea of 'natural worth' seems odd - surely by installing some major industrial players into Greece the worth of Greece would rise. But I am pretty sure the other EU players including the UK are looking to grab the few big industrial players for themselves, we all face Greece's problem. The Marshall Plan applied the jump leads to Greece's economy, the engine spluttered but never had been capable of running at anything like EU speed. Is it time to resurrect the 'lump of work' hypothesis. Given the scale of global industrial players and ease of transport etc then such production centres as are needed will tend to lump together - design in one place and manufacture somewhere else - but not many of either, just big in scale. Ah say the wiseacres - let us all become designers - preferably high-end ones. The snag is that about 70% of us are just not capable which leaves us all in a fix. It is time to stop the blame game. Consider the following points-based narrative (reducing the universe to Germany and Greece). 1 - It has been Germany's explicit policy to run a persistent trade surplus for quite a while now. 2 - From this it follows with mathematical precision (to use a phrase by Yanis Varoufakis) that there will be a(t least one) country with a persistent trade deficit. Enter Greece. 3 - This means that Greece will run out of money and hence Germany will run out of surplus (as Greece and Germany are part of the same currency union). Germany solves this problem by lending to Greece (via its banks). 4 - Not surprisingly Greece cannot pay back these loans (after it spends it on German goods), as it already has sent the money to Germany in exchange for the goods (thus maintaining Germany's surplus). It doesn't really matter WHY Germany managed to run the surplus and Greece the deficit, for the stability of the currency union it just matters THAT they did so. It should be clear that any blame is shared 50-50 in this collusion of misguided policies. So it is time to stop blaming and start solving the problem: no viable currency union can allow the build-up of persistent regional surpluses and their concomitant persistent deficits. This is a matter of elementary math. The blamers don't even need to go forth and multiply, they just need to learn to add and subtract. This seems a reasonable argument. I would add that there appear to be two mental cages or closed system thinking going on in the Eurozone. The first as you've mentioned the failure to recognise that excessive Euro flows from other Eurozone countries are going to Germany as well as other global currency flows that enables the Germans to also pretend that others have no need to resort to sovereign or private bank loan creation of money to maintain a reasonable standard of existence. What I find curious, however, is the emphasis on all countries needing to achieve competitiveness in manufacturing when having just returned from vacation in Florida (USA) their real estate market is beginning to boom again as demand increases for a life in the sun at least for some if not all of the year. Greece, of course, can be viewed as having the same good fortune to attract sun seekers for either permanent or part-year residence along with their incomes/pensions from the EU not to mention a wider area in that region of the planet. To make Greece more attractive to such sun seekers, however, requires substantial infrastructure investment, such as minimal travel time access in the shape of airports, road, rail and sea networks. Such infrastructure investment as we know requires a relatively high level of government spending and to have a Euro system that has deliberately attempted to denationalise or shackle the public good of sovereign government's ability to create debt and interest free money for such spending seems insane to say the least unless looked at from the perspective of bankers wanting to benefit from attempting to monopolise the process of money creation!
" It has been Germany's explicit policy to run a persistent trade surplus.."
Not a word of that is true. There is no such policy. But if it is explicit you can have no difficulty in giving a link.
" It has been Germany's explicit policy to run a persistent trade surplus..."
But since you think it is explicit, you can have no difficulty in giving a link to prove your point. Frances, have you looked at the shipping industry in Greece? I've seen the argument that it's there where most of the lack of competitiveness can be found. Global shipping hasn't done well since the beginning of the global financial crisis, and shipping is a big sector in Greece. I think that's a very good point. The slowdown in global trade has to have been bad for Greece's shipping industry. If Greece's problems are not so much the consequence of fiscal profligacy but of private profligacy, what is to be done? The modern system of private debt forgiveness is individual bankruptcy. That means that the bankrupt has to give what he has and a part of his future earnings to his creditors, while being protected from starving by retaining a part of his property and earnings or by welfare. So: what is your solution for the tax-evading Greek dentist who bought too many BMWs? Bankruptcy or debt forgiveness without bankruptcy? is very good....i like this article.